The world’s most powerful typhoon of the year, Typhoon Yolanda (International code name Haiyan), struck the Philippines Thursday, November 7, 2013. According to the Philippine Atmospheric Geophysical and Astronomical and Services Administration (PAGASA), it first smashed into Samar and Leyte, with maximum sustained winds at 235km/h, with gusts up to 275 km/h. Along with it came storm surges that reached as high as 20 feet, engulfing coastal communities. The devastation spans over 7,251 barangays in 471 municipalities and 51 cities. Over 8 million people in 43 provinces of Regions IV-A, IV-B, V, VI, VII, VIII, X, XI and Caraga are affected. As of writing, the National Disaster Risk Reduction and Management Council (NDRRMC) has reported 2,357 deaths. There are unofficial reports from the media that account the death toll to reach as much as 10,000, basing on reports from local officials. Of the 582,303 displaced individuals, only 359,574 are in 1,099 evacuation centers. Thousands remain missing. Means of communication and transport remain a problem in the affected areas. To expedite the rescue, relief and rehabilitation efforts, Dumangas and Janiuay in Iloilo, and the Province of Antique have been put under state of national calamity. Assistance, however, such as distribution of food, clean water and medicines, is only beginning to arrive four days after the typhoon. The NDRRMC reports that PHP 22, 796, 391 worth of relief assistance has already been provided. This is, however, a far cry from what is needed in the situation. This is evidenced by the looting from malls, grocery stores and shops for necessities such as food and clean water. 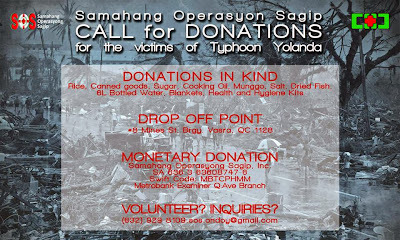 The CHD together with Samahan Operasyong Sagip (SOS) is appealing for donations to the affected populations of ST Yolanda. Relief delivery is the immediate response to extend aid to all survivors in the Visayas. We accept cash deposits in any amount. 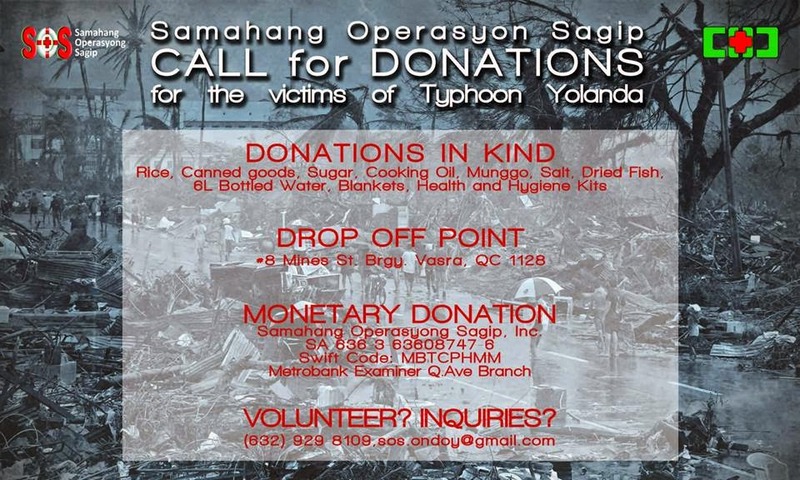 You may also donate in kind (rice, dried fish, canned goods, mung bean, oil, salt, sugar, water and laundry soap). Volunteers for repacking of goods and in providing of health services are also needed. Account name: Samahang Operasyong Sagip, Inc.